I bouht some erasers at the dollar store for holding the quilt down while I'm quilting. The erasers are about 2 inches wide and 6 inches long. The gloves are too hot. I hope they work like I think they will. Thats an awesome idea!! very smart thinking. Keep us posted on how they work out. Hummm you will have to let us know, I can't wear the gloves and all I do is grab the fabric as a free motion quilt. This looks interesting. Great idea and i hope they work for you. I use the Machingers gloves and my hands don't get hot. I use the grippy shelf lining also. 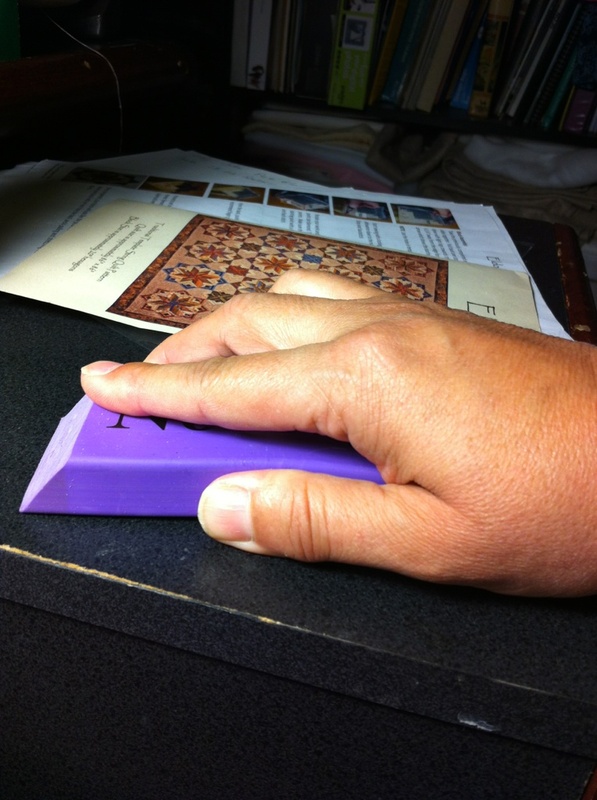 It is easy to move to the area I need to grip and it keeps my hands from getting hot. Even Machingers are too hot for me any time of the year. I have something similar to that and it works great. Good idea! I use dishwashing gloves - but have cut them so I just use the 1st two fingers. That way my hands don't get hot. Never thought of that, great idea!!! I have seen where they use sponges also. Me, I love the Fons N Porter gloves, I cut the fingertips out and they are perfect. Neutrogena hand cream works also. It is the high glycerin content that makes it work so well. You could also use a drop of straight glycerin. It isn't greasy so it won't stain. I have tried it while practicing but not on a big quilt so I don't know how often you would need to reapply. I have this problem which in UK is very strange as everyone wears gloves. I cut pieces of the car non slip stuff to go under hands and keep them flat. Hands stay cool and quilt glides under the needle. Some here do wear those gloves used by horse riders for grooming. That's a great idea, i also have the Fons and Porter gloves. I HAD to cut the fingers out because I stitched my quilt to my glove!!! Thank goodness I did'nt catch my finger. I'm going to try your method, thank you! I also use the straight glycerin. Love it. I find I reapply infrequently even when doing free motion on a large quilt. So much easier than any other product like gloves or shelving material for me. Sounds like a good idea to me. Let us know how it works out. I use the rubber finger tips on my thumbs and middle fingers only - works well for me and easy to take off and on. I use the Machingers gloves too;all of the other gloves get way too hot.